Montreal’s Olympic Stadium hosted two Major League Baseball (MLB) exhibition games this past weekend. They were the first MLB games held in Montreal since 2004, when the Expos – that began in the city in 1969 – were relocated to Washington, DC and became the Nationals. The games did not actually feature the former Expos franchise but, rather, the Toronto Blue Jays and the New York Mets. 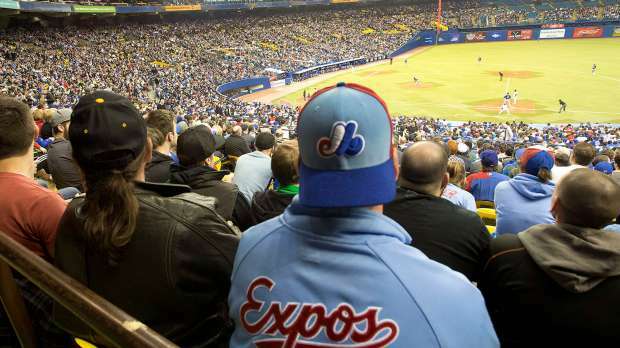 Still, the games – which drew immense crowds on both Friday night and Saturday afternoon – were widely celebrated and suggested that Montreal could potentially be home to an MLB franchise again in the future. “Nostalgic” was one of the ways that the weekend games were described. Certainly, having a chance to celebrate and fondly remember the Expos franchise was one of the key selling points of the games. Both Friday night and Saturday afternoon featured ceremonies honouring past players and teams and, in many respects, the game was much more about the Expos than either of the Blue Jays or Mets. In some circles, the games were dismissed as dewy-eyed sentimentality; a nostalgia for a past that wasn’t particularly great, in a city that – it is suggested – is in perpetual decline. Certainly, there is a case to be made that these games could have been little more than a chance to say goodbye to a long-departed part of the city’s sporting heritage. But, at least from my vantage point, it didn’t seem to be that way. Rather, I was reminded of Philip Moore’s article “Practical Nostalgia and the Critique of Commodification: On the ‘Death of Hockey’ and the National Hockey League.” In it, Moore argues that nostalgia need not just be a sentimental longing for the past, but rather can be used as a roadmap of sorts, of reclaiming a past for some future endeavour. Seemingly, the games this past weekend were almost as much about the future – a city full of confidence, optimism, and (perhaps) another MLB team – as they were about reliving the glory days of the team, its players, and the city. Nostalgia is often used as a pejorative. In Montreal’s case, nostalgia seemed to be a starting point. By Gregory Ramshaw in Uncategorized on March 30, 2014 . Reblogged this on Around The Base. I wonder if this will become a regular thing such as the Raptor’s 2010, 2012, and 2012 preseason games at the Bell Centre (which were amazing to attend, btw). As Montreal lacks both a baseball and basketball team, I believe that this is fantastic marketing ploy by only Canadian franchises in these leagues to capture and maintain loyalty of ‘their’ audience by bringing the game to the nearest biggest Canadian city. That being said, many Montrealers were very reminiscent of their beloved expos this past weekend and were nostaglic for the days gone by while definitely enjoying the game. And this Montrealer can’t wait to attend the Blue Jay’s home opener on Monday. Cheers! I wonder if this will become a regular thing such as the Raptor’s 2010, 2012, and 2014 preseason games at the Bell Centre (which were amazing to attend, btw). As Montreal lacks both a baseball and basketball team, I believe that this is fantastic marketing ploy by only Canadian franchises in these leagues to capture and maintain loyalty of ‘their’ audience by bringing the game to the nearest biggest Canadian city. That being said, many Montrealers were very reminiscent of their beloved expos this past weekend and were nostalgic for the days gone by while definitely enjoying the game. And this Montrealer can’t wait to attend the Blue Jay’s home opener on Monday. Cheers!